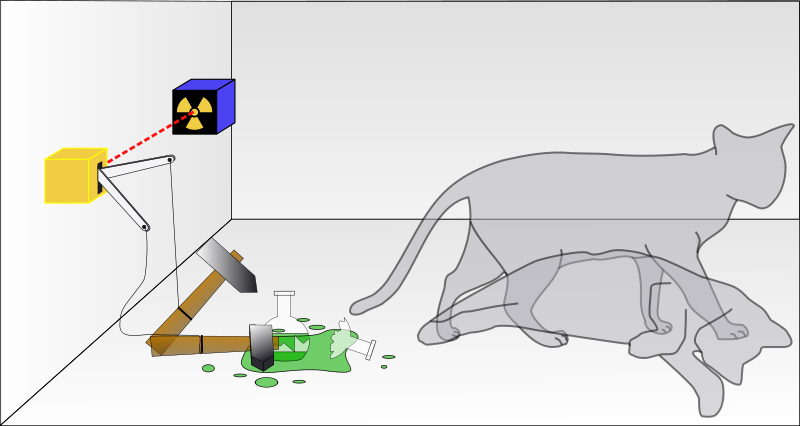 It is hard to imagine or to visualize the two states when imposed onto one another like if a cat (live cat) is placed inside the box having a radio-active source, a counter (geiger counter), a hammer and a glass flask (sealed one) containing deadly poisoned fumes, is there be any possibility that CAT IS ALIVE AND DEAD AT THE SAME TIME?? This is what Quantum theory showed i.e. the mixture of two states. Quantum physics is the branch of physics which deals with the behavior of light and matter on the atomic (and subatomic also) scale. It attempts to describe and account for the properties of molecules and atoms and their constituents i.e.– electrons, protons and neutrons and other more particles such as quarks and gluons. The properties include interaction of particles with one another and with electromagnetic radiation (i.e. light, X-rays and gamma rays). Broadly speaking, Physics is divided into Classical and Quantum. By Classical, it is meant that those late 19th century studies which nourished on academic diet of Newton’s mechanics and Maxwell “electromagnetism”, whereas Quantum is the studies up to atomic level and their interaction with light. A natural question arises what led to the development of two roads, there were some assumptions where some classical physicists were stand firm but those assumptions have doubt in depth which caused to germination of new idea. It was a 30 years war between Quantum physics verses Classical physics. ​The universe was like a giant machine set in a framework of absolute time and space. Complicated movement could be understood as a simple movement of the machines inner part. The Newtonian synthesis implied that all motion had a cause if a body exhibited motion, one could always figure out what was producing the motion. This is simply cause and effect. If the state of a motion known at one point - say at present - it could be determined at any other point in the future or even the past. ”Nothing was Uncertain” and this was determinism. The properties of light are completely described by Maxwell electromagnetism wave theory and confirmed by interference pattern. It was possible to measure any degree of accuracy the properties of a system like its temperature & speed. There are two physical models to represent energy in motion. a) One a particle is represented by an impenetrable sphere like a billiard ball. b) Wave, like that which rides towards the shore on the surface of ocean. There were meetings hold between 1911 & 1927 participants were invited and asked to communicate on a pre-arranged topic. The 1927 gathering was devoted to quantum theory and attended by no less than nine theoretical physicists who had made fundamental contribution to the theory. All were set to work discovering the properties and performing the experiments. Bohr, the hard worker of the Quantum field helped other scientist to explore their work. The period of 1911 to 1927 was a great time for the nourishment of quantum world. Many theories and discoveries came forward, some of them got praised while other came under attack. With the gold foil experiment and the discovery of nucleus, it provides a platform to the scientists to seriously think for the atom and their new ideas. ​Bohr worked hard and presented his first atomic model. Other scientists like Arnold Sommerfeld and Zeeman contribute and developed the three quantum numbers namely n, m, k; but there was still something missing as the hydrogen spectra showed further lines in the magnetic field which results the further discovery of 4th quantum no. i.e. electron spin. The particle/wave controversy is long from the days of Newton & Huygens who argued about the nature of light.